Renovation Rescue or Disturber of the Peace? Home » Kin Blog » 2014 June: peace » Renovation Rescue or Disturber of the Peace? Have you ever considered what might be disturbing your peace? Not world peace, or even your peace and quiet, but your inner peace. In Australia, our TV screens and magazine racks are full of home and garden ‘renovation rescues’. I enjoy seeing the transformations in the ‘before and after’ photos and I admit to being a bit of a renovator myself. I have a go at DIY, home decorating, revamping something old and creating beauty out of simple objects. It is a joy, and it exercises my creative expression. At times I’ve had to re-evaluate however, as I’ve realised that my ‘renovation rescues’ can become ‘disturbers of the peace’ – my inner peace. In my bid to create the ‘perfect’ home or even a ‘creative’ home, I find that the craziness of spending time (and money) to create the masterpiece sometimes becomes a ‘have to’. I lose perspective as I take my eye off what I already have, to focus on what I want. It can also become an insatiable desire that is never completely fulfilled as the next ‘improvement’ is just around the corner. As I sit in my garden with a wonderful hot steaming cup of tea, instead of breathing in the aromas of the flowers and enjoying the sunshine, I find myself thinking about all the things that need doing: the paving that needs finishing, the weeds that need pulling, the trees that need pruning, the cubby house that needs painting…and on and on it goes. I am not focusing on the beauty, or the quiet, or the sun on my back. I’m not enjoying the rewards of hard work already done, or applauding the achievements, but rather I’m fixated on the unfinished and on that which needs to be improved. I looked at my bathroom the other day and decided to consciously challenge my thinking. My bathroom was built in the 1980’s and isn’t what I’d call beautiful. Renovation has been on the agenda for a while. I decided to go the way of gratefulness and see what happened. I said to myself, “this bathroom is fully functional, has a perfectly good working toilet (albeit a lovely shade of green), a wonderfully warm shower (even if the tiles are covered in mustard coloured dandelions), hot water ‘on-tap’ in my (also green) basin and a great big mirror to attend to my ablutions. What more do I need? Does the colour matter that much? Why do I need the best and the latest? At what cost to my family will I have the trendiest bathroom in town? There’s something in that. Gratefulness. Contentment. Peace. I have begun to equate the three. When I am grateful for what I have, rather than yearning for what I don’t – I am more content and more at peace. Grateful for my safety, for shelter, food, warm clothes, friends, family, love…the basic things we so easily take for granted. When I am not wishing my life away with things that ‘could be better’ – I am more content and more at peace. When I take time to enjoy the moment and relish the everyday things – I am more content and more at peace. When I take a walk down the park, instead of thinking about my ‘worries’ (as I too often do), or what to cook for dinner, I try to take the time to acknowledge what is right in front of me. The blueness of the sky, the amazing array of trees and flowers, the different shades of colour, the birds singing in their incredible octaves and the ducks with their crazy antics on the pond. This serves to create an enormous amount of inner peace as I soak up the ‘now’. When was the last time you immersed yourself in gratefulness? How often do you stop and soak up the moment? And contentment? What do you want so bad that it has overshadowed the things you already have? Perhaps for you the ‘renovation rescue’ isn’t a problem, but are there other things that are disturbers of your peace? The “when” questions are so spot on especially “when I’m not so tired”. Learning to count my blessings even when I’m tired. 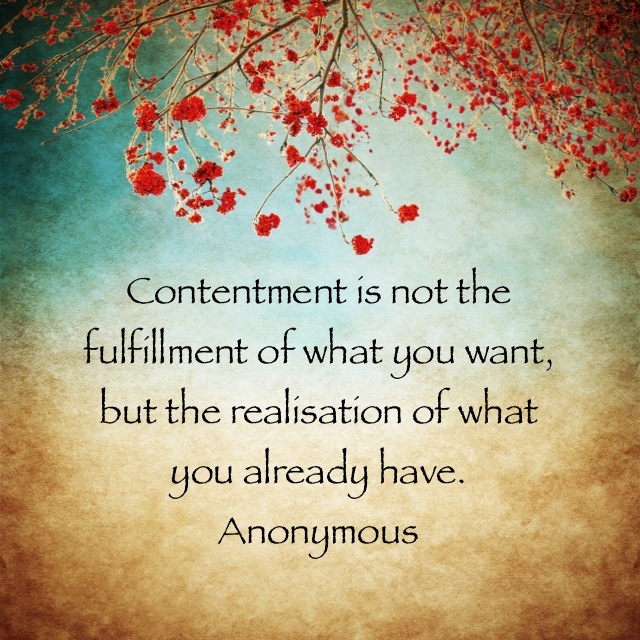 Gratefulness and contentment certainly bring peace. Great thoughts Esther!